There are few things sweeter than proving a hater wrong. If you ask me, it's the ultimate form of revenge. Not telling them off. Not blowing up their phone with long-winded text messages about how big of a mistake they made, but by showing them, through action, that they were completely wrong about you. It's all about that karma. And that's exactly what this college student did. Daivon Reeder from Detroit, Michigan studied criminal justice and military science at Eastern Michigan University. He's graduating this week. And although Reeder always believed in himself, sadly, a figure who could've been extremely influential in his life, did not. It's truly a sad story but definitely has a happy ending as he proved that negativity to be wrong. Reeder's stepfather allegedly told him it was "pointless to go to orientation [because he] wasn't going to graduate." Which makes this photo he tweeted so, so sweet. In an interview with BuzzFeed, Reeder said, "I just thought the situation of mine was ironic," and he's totally right. 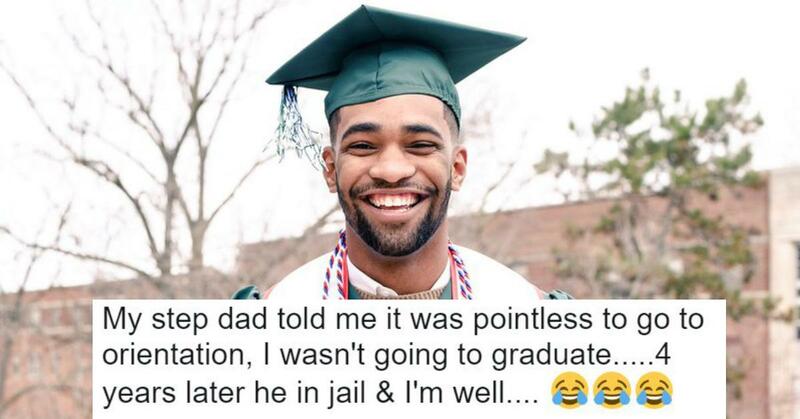 I mean, it doesn't get much more ironic than the dude who said you'd never graduate college looking at your success through jail bars. Twitter loved Reeder's clapback at his stepdad, congratulating him for proving his hater wrong. There were also tons of people who are convinced that Reeder is really NBA star Vince Carter in disguise. For Reeder, all of the retweets and words of encouragement made his accomplishment that much sweeter. "I really do appreciate all the support. It makes these last few years worth everything. I'm just a first generation college kid from Detroit trying to beat the odds. I guess people can relate to a humble beginning."